White House Principal Deputy Press Secretary Raj Shah has confirmed that Sadler has left her job “within the Executive Office of the President,” but it remains unclear whether her departure was related to her imprudent remark on McCain’s terminal illness. — Jamie Dupree (@jamiedupree) 5 июня 2018 г. Some media reports suggest that Sadler was pushed out of her position because she had accused White House Strategic Communications Director Mercedes Schlapp of being the one who leaked her comments to the media. Trump aide who decried McCain as "dying anyway" is out. But it's not due to what she said. It's because she accused her boss of leaking it in days of fights over the leak. Trump did not want apology from the White House — nor to fire her for saying it. — Josh Dawsey (@jdawsey1) 5 июня 2018 г. — Kyle Griffin (@kylegriffin1) 30 мая 2018 г.
It’s about time. She should have been fired immediately after she said it. I hate that she tried to turn this reprehensible act into a leak scandal. She should never get work again. 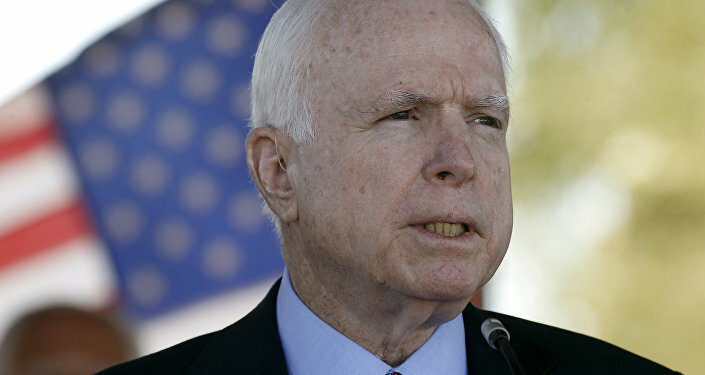 Senator McCain is a better man and deserves so much more respect. — Danielle Wallace (@StarTrekFan2015) 6 июня 2018 г.
Kelly Sadler (on John McCain): It doesn't matter. He's dying anyway. It doesn't matter what you think, Kelly. You're fired anyway. — JRehling (@JRehling) 5 июня 2018 г. — Alicia C. (@aliciainedmonds) 6 июня 2018 г. — Sarah Walsh (@Serahwersh) 6 июня 2018 г. So, did they just move her to the office of the vice president? — Like, Enormously Consensual (@Snowhawk04) 6 июня 2018 г. She got fired for accusing her boss, Mercedes Schlapp, of being a leaker. Not for the McCain remark. — Carson Stanwood (@carsonstanwood) 5 июня 2018 г. Rumor has it @kellysadler45 was fired for accusing her boss @mercedesschlapp for being the wh leaker. ms evidently called her the b-word and axed her. So accusing is more offensive than making vile statements. Sounds about right for @realDonaldTrump dumpster fire. — DREW (@ALLCAPSTWEETX) 6 июня 2018 г. Commenting on Sadler leaving her job, ex-White House Communications Director Anthony Scaramucci told CNN that “someone had it out for” her. “Someone had it out for Kelly Sadler. Because that was a sorry joke. It’s an unforgivable statement – I’m not here suggesting the statement was OK – but what I am suggesting as someone that’s run a pretty decent corporation, that when you’re sitting inside the inner sanctum and somebody says something like that, to run outside the sanctum and rat on that person – I think that’s a terrible thing to do to the person,” he said. Immediately after the incident, White House Press Secretary Sarah Huckabee Sanders blasted the staff, with some alleging that she was more upset with the leak than the remark itself.